In case you’ve managed to forget the tragic tale of Aereo, brace for some flashbacks. 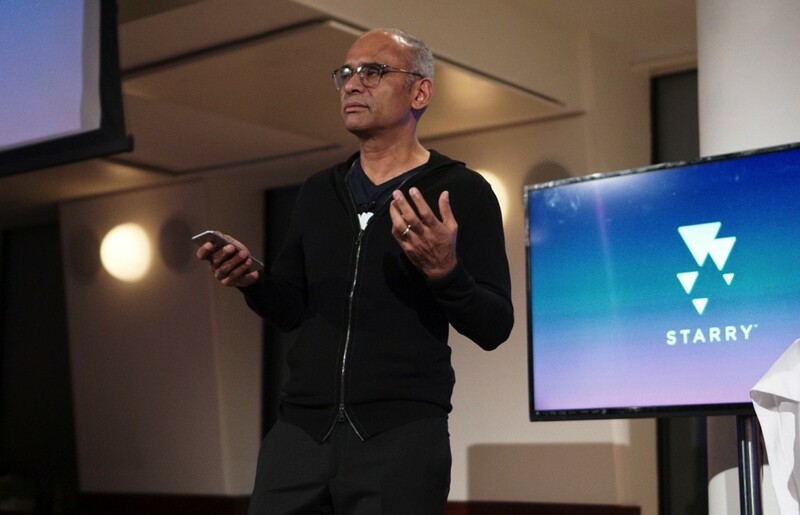 Aereo founder Chet Kanojia announced last week that he is introducing a new Internet service – called “Starry” – that uses millimeter wave technology to wirelessly deliver Internet speeds up to 1GB. Kanojia aims to disrupt the business of broadband with this latest venture, a new take on fixed wireless technology. Potential legal battles aside, it appears Starry might face some challenges on the technical front too. Re/code’s Ina Fried put together a great analysis of some of the technical stumbling blocks that Starry might face, based on issues that plagued similar ventures in the past. Here’s the basics: Starry uses technology called “millimeter wave band active phased array technology.” This being Translation Please, indulge us in doing what we endeavor to do. 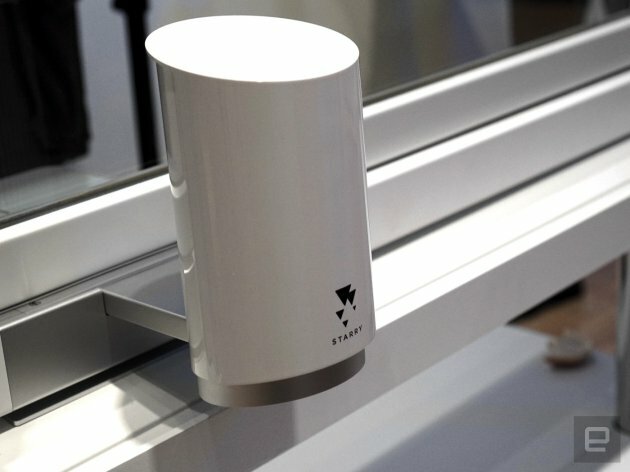 In a nutshell, Starry puts a bunch of little nodes called “Starry Beams” on rooftops in densely populated areas (this might ring a bell with anyone who used Aereo), and gives its customers little receivers called “Starry Points” to stick outside of a window. The Starry Beam shoots out millimeter waves in a bunch of different directions (this is what they mean by “active phased array”), and these waves bounce off of buildings and other obstacles until they reach your Starry Point. 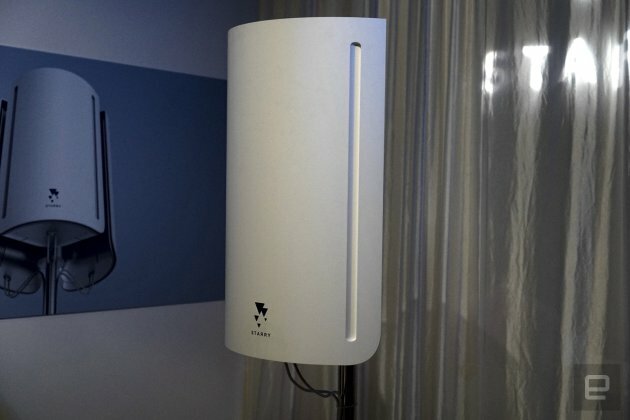 Aereo claims that they can transmit a reliable signal without line-of-sight from the node to the receiver, unlike previous attempts at fixed wireless Internet. 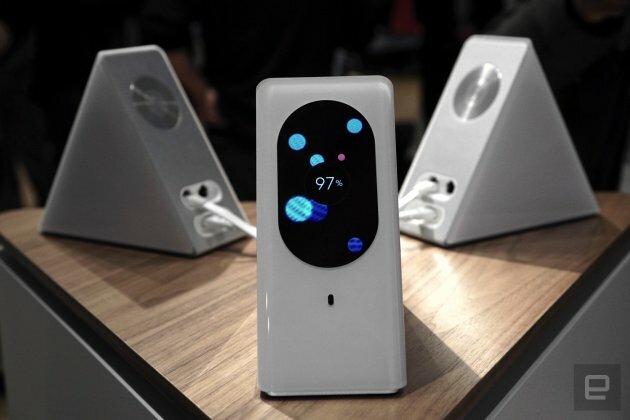 Aereo also offers the optional Starry Station, a $349 Android-powered router with a touchscreen that monitors its own connections, handles parental controls, and a bunch of other tricks. According to Kanojia, this approach will save Starry, and its customers, a lot of time and money. “We can deliver faster broadband with no regulatory wait time and it will cost us only $25 per home,” he said on the TechCrunch call. No word yet on pricing, other than that Starry will be a tiered service based on speed (topping out at 1 GB up and down). We can’t wait to see this one in action – and according to Artemis founder Steve Perlman (yes, that Steve Perlman — former head of WebTV, Rearden Steel and Moxi), we might see it in Boston later this year (assuming the FCC gives the nod). Plus, Chet’s just an interesting guy to keep an eye on. He started out in cable, founding Navic Networks in the early 2000s. Remember? Microsoft bought Navic in 2008 for a reported $250 million; Chet’s been throwing wrenches at the industry that launched him ever since. Which makes us wonder: Who pissed Chet Kanojia off so bad? Getting clearer? Here’s more. It started in July of 2010 as a collaborative project between NASA and Rackspace, with a goal of making it easier to use regular, off-the-shelf computing hardware to handle public and private cloud activities. Last month, Time Warner Cable posted a tech blog titled “One Year Later: Setting Up OpenStack at TWC,” penned by its lead “stacker,” Matt Haines (real title: VP, Cloud Engineering and Ops.) In it, he describes how his agile team “designed and deployed an enterprise-grade cloud,” using OpenStack, in its two national data centers. Both providers settled on OpenStack as an alternative to buying proprietary set-tops, control components, and servers from the same company. Troubleshooting gets easier, they submit. Rolling out new services, features and bug-fixes gets (way, way) faster. It’s worth pointing out here that the long-held industrial fears about open anything are rapidly melting away. 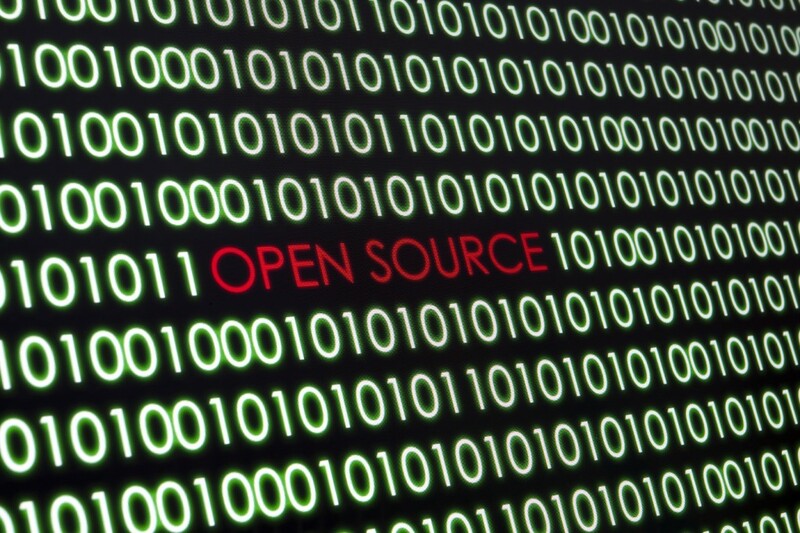 No longer are concerns about mad coders “doing harm to the network” a definitive reason to not take an open source route. The vendor community, always in a weird spot when their customers decide to lean toward “build” vs. “buy,” is following suit. Cisco, during the 2015 Consumer Electronics Show, heavily emphasized its investment in, and development of, Openstack-based components for multichannel video providers. It follows that OpenStack is behind all the tech talk about “transparency,” and the tales about how this-or-that was about to go kaflooey, but because they had visibility into the software (which always comes in “stacks”), they fixed it (in hours, not months), averting disaster. Anecdotes like this abound in OpenStack speak. Everything about OpenStack is open, even how papers are vetted for its annual conferences, which attract around 5,000 attendees, twice a year, for five days. (The “stackers” met in Atlanta and Paris last year.) For the Paris confab, in November, 1,100 papers were submitted for consideration (by contrast, cable’s tech events typically attract around 300 papers, vetted by committee.) The entire OpenStack community voted on who spoke. As “open” stuff goes, OpenStack is decidedly one to know. They meet again in Vancouver, from May 18-22; on any given day, regional groups host meet-ups all over the world. Time to get your stack on. Here’s a way to let the imagination run wild: Think about your stuff that’s equipped with a web browser. Now imagine being able to talk to people, using that stuff. That’s the allure of webRTC, where the “RTC” stands for “real time communications.” It’s a technology that grew out of the World Wide Web consortium (which goes by “W3C”) to support browser-to-browser applications, like voice and video calling, with no need to download anything. Click to communicate. Also at CES, AT&T became the first American carrier to announce an API (Application Program Interface) for its webRTC plans. Why would a developer want to write code for AT&T, vs. for any garden-variety browser that can do it? Presumably to be able to call to the numbers within the public switched telephone network (PSTN) — in other words, the traditional “black phones” connected to the original wired phone network. Last week, the browser Firefox announced “Hello,” a plug-in that, once plugged in, enables webRTC-based calling. Also last week, up in Canada, ECN Capital launched an online investment program for private markets, based on webRTC. Last year, at The Cable Show, Comcast showed a way to “live stream” video from wherever you are, to other Xfinity customers. You’re at the wedding, but Gramma couldn’t go, so you hold up your phone and stream it to her big screen. They called it “Share.” It, too, is anchored in webRTC. Use cases show up everywhere: You’re browsing places on AirBnB. 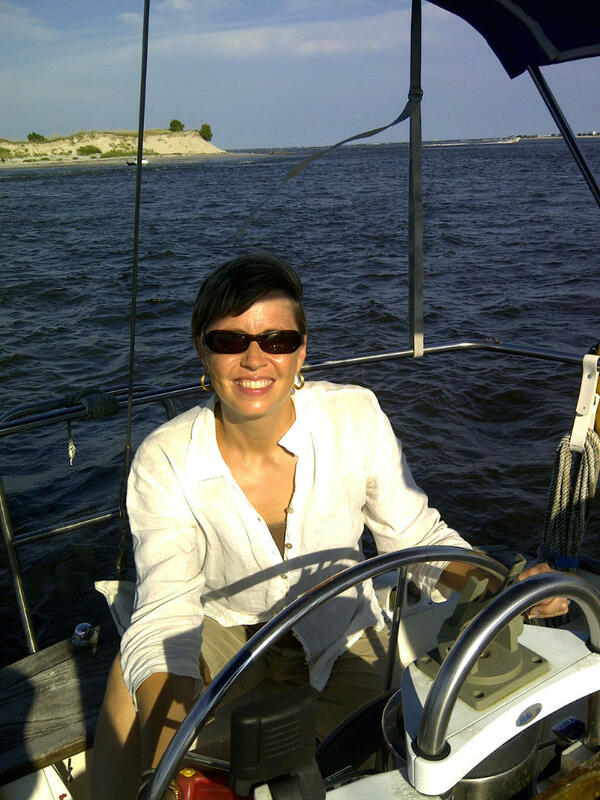 The host happens to be home, and amenable to “showing you around,” live, with video. You’re on a customer care call, at your desk. You need to leave. 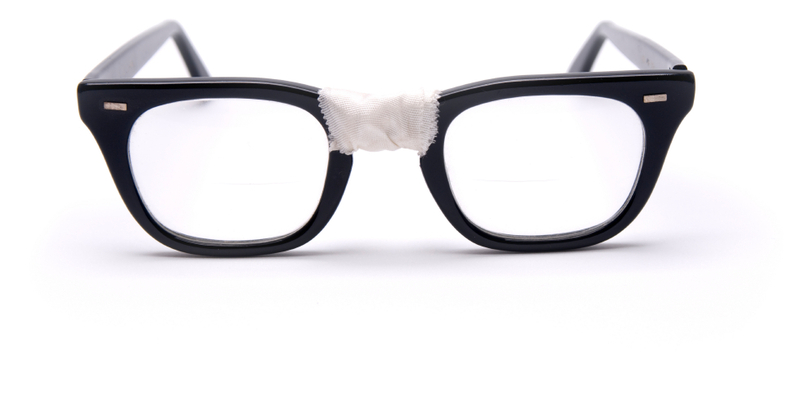 Switch the call to your phone, tablet, watch — that’s webRTC. As of now, there’s not a straight line between webRTC and the Internet of Things — the IOT is a sensor story, now. But the browser can’t be far behind. And when that happens, so opens a whole new way to call people, with your voice or your whole face, from whatever the device is. So far, I can’t quite imagine taking a call from the fridge. But years ago, when digital was just starting, I used to say that anything that helps people to communicate better, is a winner. At the time, I used the example of being able to “talk” with my nieces about a particular live TV show — even though they live far away. This is that. And like everything else based on IP (Internet Protocol), webRTC is coming. Whether you choose to use it is up to you. The Consumer Electronics Show, which sprawls a sensory overload across two million square feet (that’s 35 football fields) this week in Las Vegas, can be a useful forecaster of the kinds of stuff we’ll (someday) bring into our lives and homes. It can also be an electronic petri dish of the spectacularly weird. Connected forks, to scold you when you’re eating too much, or too fast. Brainwave-sensing headbands, to tell you when you’re in a bad mood. Sensors, to monitor everything from sun exposure to canine/feline psychology. Consider this a curated assembly of the kooky at this year’s CES — starting with the combo LED light bulb and JBL Bluetooth speaker, from Sengled. Each $60 bulb screws into an ordinary lamp, then plays stereo sound from two built-in, three-watt speakers. A companion app controls the streaming while regulating the lighting. 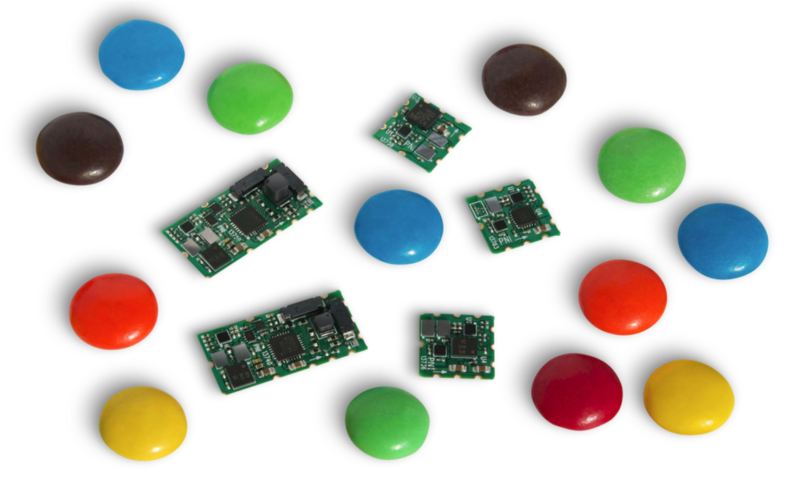 Inside each WellShell: A pressure sensor, accelerometer, heart rate sensor, GPS tracker, and gyroscope. No pricing yet; a tag of between $200-$300 is expected. Yoo hoo, runners: Are your socks smart enough? New from Sensoria (tagline: “the garment is the computer!”), the socks use “novel textile sensors” to detect activity type and impact force. Data transmits through a “featherweight, detachable anklet,” over BlueTooth, to a companion app. To trick out your smooth moves, Austin Powers-style, there’s the $270 Logbar ring. Slip it on, learn a few gestures, boom! The (decidedly chunky) ring turns on the TV, checks the weather, turns on the lights, uploads a photo, and so on. Great if you don’t mind looking like you’re plucking imaginary flies out of the air. One catch: The app has to be on and active for the ring to work. Speaking of chunky: New this year is a big, plastic, waterproof bracelet, called “Child Angel.” With its built-in GPS, your kids will never lose you again! Tired of scraping the gunk off your grill? This one’s for you: The Grillbot. Like a Roomba, for your grill! Each 30 minute cleaning cycle uses three “powerful electric motors” to de-gunk your BBQ. Comes in four colors for $130. Lastly: H+ Technologies calls its invention “Magic Box.” We call it holographic TV, baby! Perfect for a CES. Invented by Masters graduates of the Centre for Digital Media, the Magic Box converts 2D content into holographic 3D, displayed inside the box. Bonus: You can use it to charge your phone and tablet, too. For those of us headed to the annual Consumer Electronics Show, which happens a scant four days after the New Year, the holiday season necessarily includes shaking the network to get a deeper look at what’s planned. You won’t be surprised at the outlook, but here goes. First: UltraHD/4K is the new 3D, which had been the new HD, before the marketplace thud that hastened it out the door. The refrain this year, albeit not necessarily from the CE side: There’s more to better pictures and sound than “just” the television set. All explain additional ways in which innovation is happening throughout the rest of the video ecosystem — think cameras, production gear, and the technologies of storytelling. If you go, you’ll see it in the way colors look. Blacks look downright velvety, reds look royal, greens mossy. The picture overall is brighter. Much brighter. While it’s rare that the dazzle and pop of CES fare is directly relevant to this industry, wearables and cognitive computing do open a plausible stream of thought: What decisions could be made for us, that improve our media-centric life? Note that it’s likely we’ll see more “smart clothing” this year. Already we’ve seen a blazer, designed for tourists in New York and Paris, and equipped with LED lights on the sleeves, and buzzers in the shoulder pads. The thinking: Stop looking at the blue dot on the screen! Your right arm will blink and buzz when you need to turn right. Third: Smart homes, smart cars, driverless cars, smart things — sensors will sustain in show floor glitz. Entire pavilions will be cordoned off to showcase the Internet of Things, always a source of weird and interesting gadgetry, but rarely directly relevant to whatever it is we’re calling the cable industry these days. Regardless, there’s nothing quite like the Consumer Electronics Show. This will be my 15th consecutive year as (tres dorky) guide for CTAM’s tours, and while I generally dread it on the front end, I’m always glad about how it went, it at the end. We’ll keep the highlights coming. It’s the week that ends with Black Friday Crazy, which means it’s time to start thinking about holiday gifts. 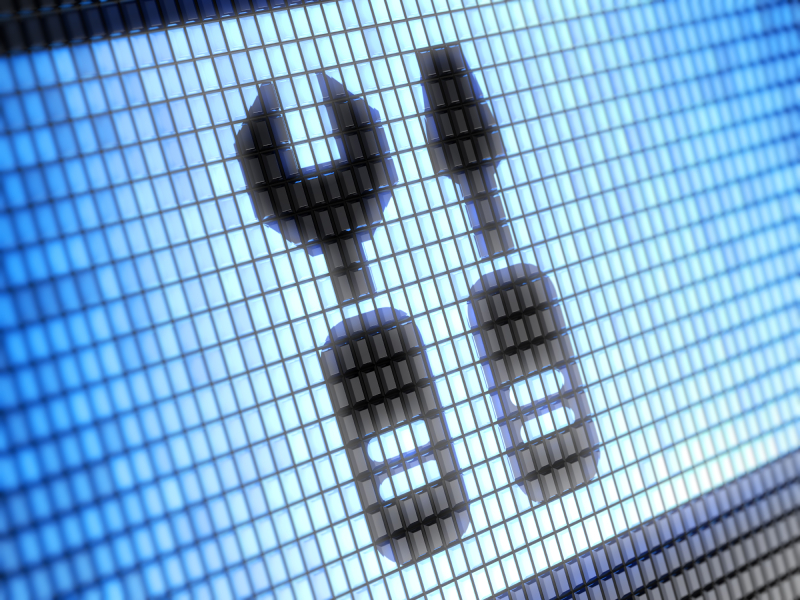 To assist you in your list, we asked our tech-side sages for advice. “Wait for price drop. Wait for 10-bit panels and High Dynamic Range,” wrote one broadcast-side engineer, who, like many content-side technologists, likes to point out that 4K television isn’t just about resolution. “Just say no. No content,” wrote one engineering pal. Happy Thanksgiving and may your television acquisition quests be suitably informed. Given that Halloween punctuates the end of this week, it seemed timely to share some changes happening in my small-but-lively over-the-top video lab. Background: The list of technologies, industries and companies that will “kill the cable industry!” is long and established. First there was microwave (a technology), then telcos and satellite (industries), then companies — name any of the OTT constituents. Spooky! Until the OTT chapter, however, it was cost-prohibitive to conduct any kind of local experiment to vet the would-be cable-killers. A microwave antenna farm doesn’t exactly fit in a back bedroom, not to mention the coverage footprints of the subsequent competitors. That’s why, a few years ago, it suddenly made sense (economically and space-wise) to see for myself: What about this growing army of video streamers is better or worse for video content consumption? 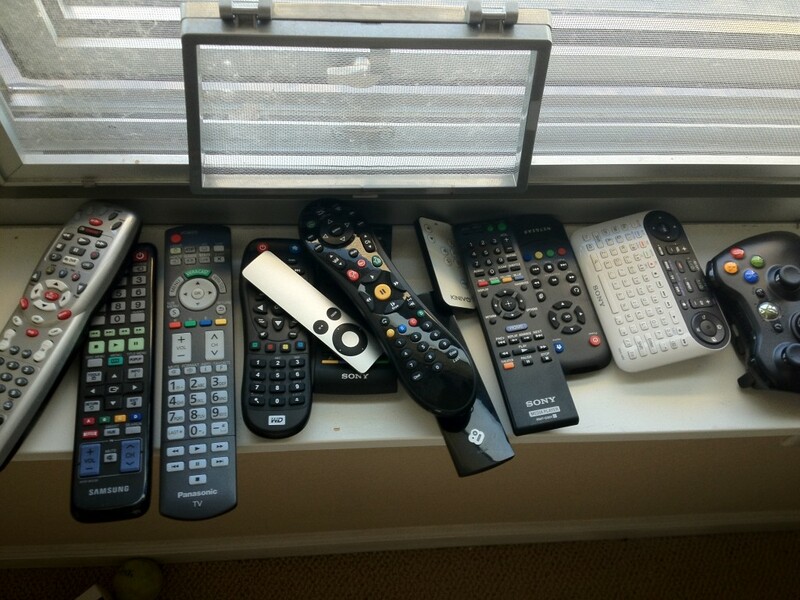 The lab hit its peak in 2012, with a gadget array so wide, the windowsill could barely hold the associated remote controls. At the end of last year, however, it started to seem like “game over.” Google finally found its way (after countless iterations of “GoogleTV”) with Chromecast, at an astounding low price point — $35. Between it, Roku, and Apple TV, plus the virtualizing of video streaming into TVs and other hardware gadgets, it started to get dull. Here’s the short list of both, so far. Actually useful: Front-door webcams, to see who’s at the door no matter where you are; beds that conquer snoring partners without the need for pointy elbows; sensors that over-ride the irrigation system on rainy days. On the oddest things we’ve ever seen list: The “selfie sombrero,” a ghastly, hot pink bonnet equipped with a tablet holder hanging from its enormous brim. A connected toilet, which quickly got hacked, enabling anyone to flush, open and close the lid, and activate the bidet. 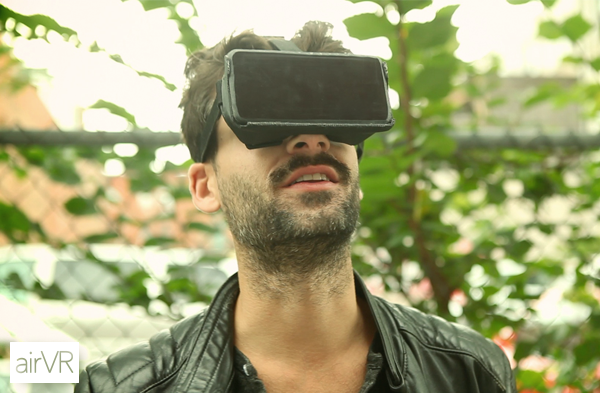 A virtual reality apparatus (“airVR”), which essentially straps your tablet to your face. And, my personal favorite, a “smart wig,” apparently useful for times when you want to advance a PowerPoint presentation by tugging on its (ghastly) sideburns. That’s the Halloween lab update. Boo! We’ll keep the lists growing. f you live in a Verizon FiOS market, you’ve likely seen the video ads denouncing upstream speeds other than theirs. If not, here’s the gist of it: Families, at home, surfing the web, but running into slowdowns when posting music and video to the web. The tagline? “Stop living with half-fast Internet,” uttered by Modern Family’s famously funny Ty Burrell, a Verizon spokesman. On the other hand, and as someone who perennially frets about the state of the upstream / home-to-headend signal direction, it’s another reminder about the growing plausibility of symmetric network traffic — meaning an environment where as much stuff flows out of a home, as flows into it. For the longest time, now included, there’s not been a need, really, for symmetry. Think about it. When you click to retrieve a web page, or to initiate a video stream, that click is tiny, compared to what comes back. In general, and at any given time, we’re using way more downstream (towards us) capacity than upstream. For me, the first vestige of the potential for upstream capacity calamities came last Spring, when my colleague Sara set up a chicken incubator at her farm. She used a paper clip to kickstand an old iPhone, which peered into the contraption, and live-streamed the output. Then, this year, the GoPro camera craze intensified. It won’t take too many of them, strapped to the dog’s head, or the kid’s bike, to gum up the upstream path. The keepers of the bandwidth in my circles assure me (repeatedly) that from a normal traffic loading perspective, we’re nowhere near the need to build for network symmetry — meaning, as much data moving away from you, as toward you. That said, there’s no shortage of gadgetry in our lives that can capture and stream video, and especially those that can be triggered to run remotely — you’re at work, but someone rings the doorbell at home. Who is it? See for yourself, via a live video stream. 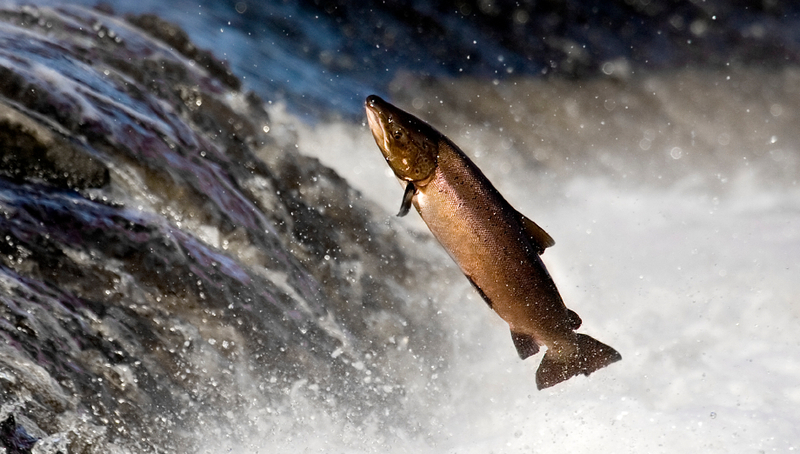 One thing is certain: We can expect more video running upstream, coincident with the webcams and GoPros we use to capture and send live video. That alone will contribute to a tilt toward symmetry. As a result, the widening of the upstream path will likely go from “not in my lifetime” — the decades-old harumph amongst technologists — to lots more trial expansions next year.